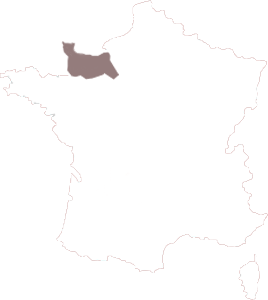 The campsite is located in the North of Manche in the Cotentin. Come and discover our campsite and its wide choice of holiday homes with sea view. Very well located and with one or more bedrooms of your choice, we are sure that you will find a holiday that suits you. L’Anse du Brick also offers you camping pitches with view on the sea for your holidays in tent, caravan or motor home. 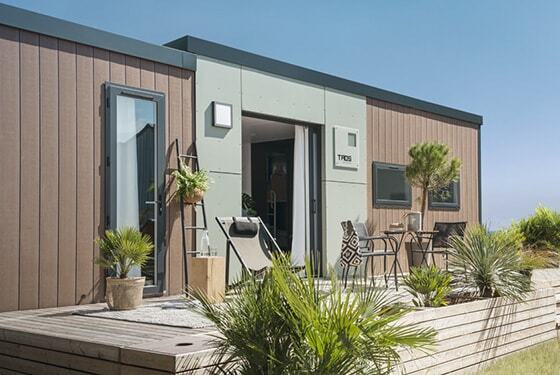 In a private park located in the heart of the Cotentin, you can benefit from one of our many mobile homes rented per week in high season. In the low season the minimum stay is 2 nights. Our park offers various services and facilities. You will be seduced by a beautifully landscaped park and an amazing view of the sea. We offer you holiday homes with panoramic sea views and partial sea views. If you choose a sea view property, you can see the sea from the terrace and from the living room in the cottage. A partial sea view holiday offers at a lower price a beautiful view of the sea from the holiday home or from the terrace, where you can quietly watch from your lounger to the sea, where the pleasure boats pass by. All our holiday homes have equipped kitchens, a living room with dining area and sitting area, 2 or 3 bedrooms and 1 or 2 bathrooms. Our chalets of 35m2 and our villas with sea view have the extra premium services, including WIFI, cot, table chair and linen included. You can also choose the paid option (final cleaning) that gives you more time to enjoy the rented space or to discover our magnificent region that stretches to the edge of La Hague and the rocks of Etretat. Along the way, a visit to the harbor of Port en Bessin Huppain, famous for its scallops, is worthwhile. If during your stay at the Castel Campsite you decide to extend your trip to Lower Normandy, you can drive towards Cabourg. Here are neighborhoods by the sea with beautiful typical sea villas, designed by architects with various influences. Spend a pleasant stay in our holiday home thanks to the various services and facilities. 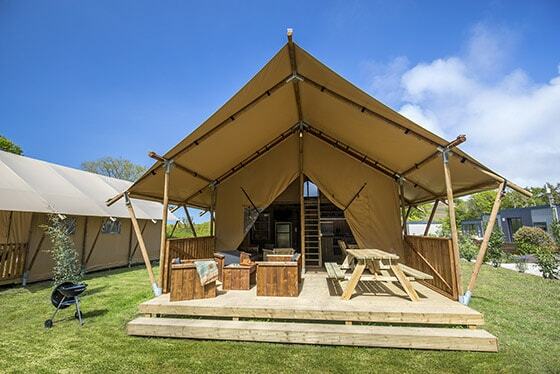 Stay in a holiday home with sea view, a comfortable stay at a 5 star campsite. We offer an indoor heated swimming pool, a heated outdoor pool with slide, a tennis court, a football field, a games room with table tennis, table football and video games. 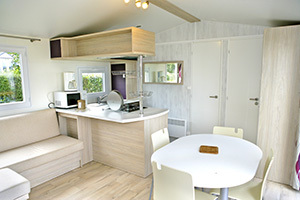 Other services are also offered, such as WIFI on the whole campsite, 30 minutes free per 24 hours and per device. If necessary, a computer is also at your disposal at the reception. The campsite has washing facilities : washing machines and dryers for a fee. The use of barbecues is allowed on your camping pitch. Our friends, the pets, are welcome but need to be leashed inside the campsite . There are many other services so you can benefit from your stay under the best conditions. The Castel Campsite l’Anse du Brick is located at 250 km from the north of Rennes. It offers its holiday homes in Normandy, near the village of Fermanville, from where you can enjoy a beautiful view of the sea. Every holiday home has a private parking place, ideal if you want to unload quickly and want to benefit from a family residence under the best conditions. Escape the daily life and discover our region full of culture and history. Visit Bayeux with its tapestry and discover the conquest of England by William the Conqueror, depicted on canvas over 1000 years old! On the landing beaches you will discover the history of the 2nd World War with various museums and military cemeteries, impressive places full of emotion, still clearly tangible. 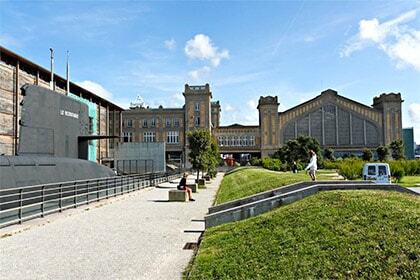 Do not forget to visit Cité de la Mer in Cherbourg, here lies the core submarine of more than 120 M long with a sea aquarium. Relax after a walk along the port of Barneville-Carteret, you can admire the villas, built in special sea style. Carteret is a charming fishing village with a lot of appeal. From your holiday home with sea view you can easily discover the towns and picturesque villages of Normandy, with granite houses, authentic for the peninsula of Normandy but also half-timbered houses, symbol of the traditional architecture of Normandy.